A steep and protracted decline in oil prices could have a significant impact on the Russian government’s ability to honor its social contract with the population. Attempting to forecast the hydrocarbons market has proven the downfall of many an energy guru. For that reason, I am particularly grateful to former top ENI executive Leonardo Maugeri for repeatedly sticking his neck out to predict that most unpredictable of markets – the oil market. Among other things, Maugeri has predicted that global oil output capacity will grow by almost 20 percent by 2020 in what could cause the price for the commodity, which is habitually described in Russia as black gold, to collapse. Some of my colleague’s predictions might come true even sooner than he has expected. Maugeri wrote in 2012 that the United States would overtake Russia as the largest global oil producer in a few years. The International Energy Agency now forecasts this will happen in 2014 thanks to the use of innovative technologies, such as hydraulic fracturing, or fracking. Fracking has already propelled the U.S. to the top spot on the list of world’s largest gas producers, a position previously occupied by Russia. Fluctuation of oil prices by just one dollar can add or deduct 2 billion dollars from the Russian state coffers, half of which are filled by budget revenues from oil and gas industries. Oil prices are now hovering at around $100 per barrel, but it will have to remain at $115 per barrel for this year’s budget to balance. Economic growth has slowed down considerably. Gross domestic product is expected to expand by less than 2 percent this year in what both Russian and foreign economists acknowledge could be a prelude to stagnation. The IMF noted in a recent report that Russia’s current model of economic growth, which is dependent on rising oil prices, has exhausted itself and needs replacing. The shale boom enabled by fracking technology is already incurring losses on one flagship of the Russian economy. Gazprom, which has been estimated to account for about 8 percent of Russia’s economy and 20 percent of federal budget revenues, has seen its capitalization decrease by more than 3 times since 2008, in part because of stronger competition on the European gas market. That competition has increased, pushing down spot prices and forcing Gazprom to discount its long-term contracts as Middle Eastern producers of liquefied natural gas have begun to divert their deliveries to Europe from the United States, which has by virtue of the shale revolution become the world’s largest gas producer. 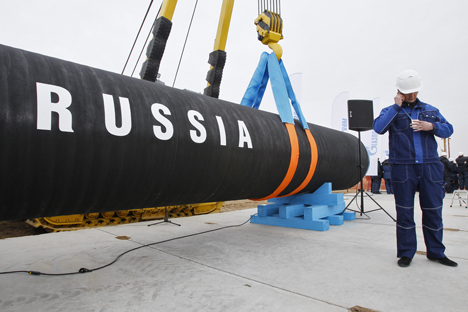 City University London professor of energy law Alan Riley estimated in an op-ed for The New York Times this month that if European prices were to fall even halfway to the main U.S. gas exchange, Gazprom would stand to lose $14 billion worth of revenue. Even growing demand for oil and gas in Asia may fail to offset losses for Russian exporters. The Russian government at first ignored the oil and gas shale boom in the U.S., then criticized fracking technologies behind it as environmentally hazardous – perhaps not unfairly – but it eventually came around to acknowledge that world oil and gas markets are underdoing potentially dramatic changes. “Forecast for Development of Energy Industry in Russia and in the World Until 2040” by the Russian government’s Analytical Center and Russian Academy of Sciences' Institute of Energy Studies warns “of big threats to the Russian economy resulting from deep transformation of world energy markets” spurred by the shale boom, among other factors. The report’s base scenario sees exports of Russian oil decline by 30 percent after 2015 in what will cause the Russian economy “lose” between $100 billion and 150 billion annually. As for exports of gas, it will decrease by 15-20 percent after 2015 in what will cause a loss of another $40-50 billion per year, according to this scenario. Paradoxically enough, the protracted decline of oil and gas prices could generate some longer-term benefits for the Russian economy and the country as a whole. When prices are high, it is hard to wean oneself off export pipelines and focus on increasing labor productivity, spurring growth in innovative sectors of the economy, improving the overall investment climate through strengthening rule of law and weakening corruption, and reducing the state’s involvement in economy.